In Windows Vista and later, software volume support is provided for audio hardware that does not include and amplifier with an associated physical volume control. The following diagram shows a simplified representation of the Windows software volume support. The diagram shows two separate audio data paths. One when an amplifier is present and one when the Windows APO software volume control is used. If an amplifier is present, the driver advertises, KSPROPERTY_AUDIO_VOLUMELEVEL. If the audio driver does not indicate that it supports KSPROPERTY_AUDIO_VOLUMELEVEL, the Windows audio engine creates a software volume control APO. 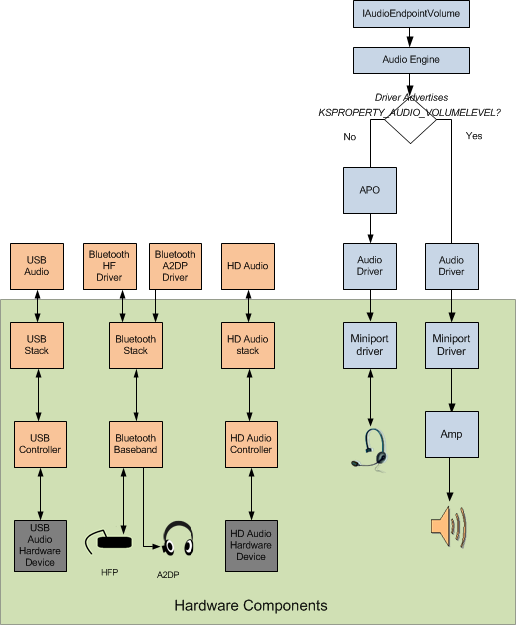 On a typical PC, only one of these data paths will be present, since there will typically be one set of audio components in the computer. The two paths are shown here for illustrative purposes. The IAudioEndpointVolume interface represents the volume controls on the audio stream to or from an audio endpoint device. If Bluetooth or USB audio is present, their volume controls will be controlled separately. When a client application calls the IAudioEndpointVolume interface in a configuration where there is an amplifier and a physical volume control present, the audio driver exposes a KSNODETYPE_VOLUME node in the topology filter. The presence of the volume node makes IAudioEndpointVolume aware that the volume level of the audio signal will be modified by the hardware. When there is no amplifier present, IAudioEndpointVolume works with the audio engine to initialize the Windows software volume support APO. Since there is no physical volume control to be modeled, a KSNODETYPE_VOLUME node is not exposed in the topology filter. Volume attenuation and gain are performed by the APO software volume support component. For information about the volume ranges and the default volume levels for the different versions of Windows, see Default Audio Volume Settings.